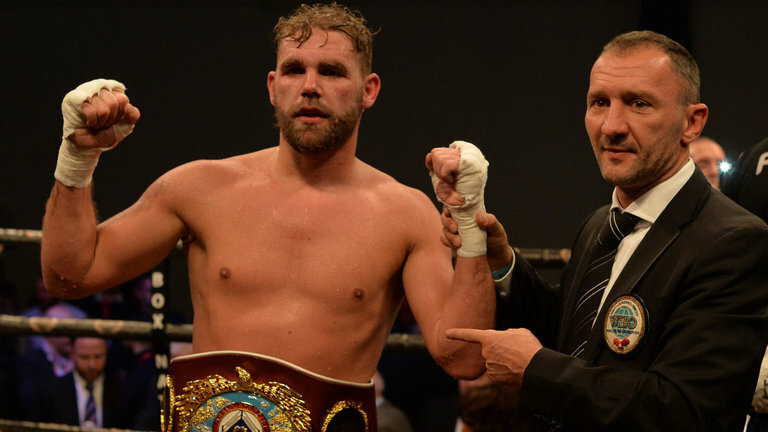 WBO middleweight champion Billy Joe Saunders 26-0 (12) says he won’t be waiting around for a big fight at 160-pounds and is prepared to look north to super middleweight if he can’t lure any of the big names into the ring in his natural weight class. Saunders, who faces veteran title contender Martin Murray at London’s O2 Arena on June 23 in his fourth title defence since winning the WBO strap from Ireland’s Andy Lee in 2015, doesn’t want to waste his prime years waiting for fights that may not come to fruition. “I’m 28, in my prime, coming up to 30, now I want to see how good I am,” he told Boxing News Online a few days after Gennady Golovkin made his 20th middleweight title defence against Vanes Martirosyan at the StubHub Center in Carson, California on Saturday night. The fight that Saunders thinks can be easily made is against IBF super middleweight champion James DeGale, who regained his title from Caleb Truax by unanimous decision last month after losing his strap to the American by majority decision last December. “100 per cent I think me and James DeGale could be made. Frank [Warren] got a good working relationship with him and obviously me being promoted by him. So I think that is a fight that can definitely be made,” said Saunders. Southpaw Saunders and DeGale have history. The two came through the amateur system together and were Olympic teammates in 2008. A fight between the two would pitch two friends against each other, but Saunders says their friendship would take a backseat when the two meet in the ring.